Bermuda House, Beach View Apartment, Gills Cliff House, Bayview and our latest property, High Street Suites 3, are perfect self catering holiday homes to help you unwind and experience all that Ventnor and the Isle of Wight have to offer. All are presented to a four and five star standard. They feature sea views (except High Street Suites 3), dedicated parking, comfort, contemporary style, wifi and widescreen satellite television. Keep in touch with the latest news from Ventnor Self Catering by reading our Blog. A fine historic 4 Star Gold Award Victorian house with 5 bedrooms, sleeping 10. High ceilings, chandeliers, fine cornicing and ceiling roses and a lovely carved staircase are some of the period features of this house, which provided the location for Sir Edward Elgar’s honeymoon in 1889. Bermuda House is at the eastern end of Ventnor Bay with fine views overlooking the harbour and beach, and close to the shops. With oak floors, three bath/shower rooms plus a cloakroom, two living rooms and a 35 foot long kitchen/diner the house doesn’t feel crowded when fully occupied. This 5 star apartment has a stunning view over the beach and English Channel, surely one of the best seaside views in Britain, which can be appreciate from the main rooms as well as from the living room balcony. 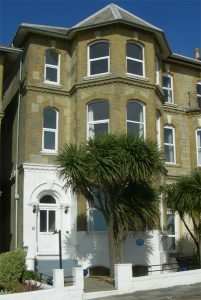 Beach View Apartment is situated at the western end of Ventnor Bay and sleeps 4 in 2 bedrooms. The apartment has its own street entrance, oak flooring, a generous sized bathroom with full size bath and separate power shower, king size double bed, HD smart TV, wifi and a fully equipped kitchen with Bosch and NEFF appliances. This 4 star apartment is in a prime central Ventnor location next to the shops and has fine views over the beach, English Channel and harbour. Bayview is a modern and comfortable apartment and has 2 bedrooms, sleeping up to 4 people. The light and airy living, dining and kitchen area is at the front of the building overlooking the sea. It is the top floor of a converted Victorian period villa in one of the best know streets in the town, Alexandra Gardens, at the eastern end of the Esplanade. The apartment has a shower room, with large walk in power shower, a fully equipped kitchen and full gas central heating. This beautiful early Victorian 5 star house was built in 1850, and is in an enviable position, high on the hill overlooking Ventnor Park and with panoramic views over the English Channel. It has 4 double bedrooms, sleeping 7 or 8 people. 3 of the bedrooms, as well as the living and dining rooms, have floor to ceiling windows facing the sea to fully appreciate the view. The kitchen is fully equipped with all that you need for 8 people. The windows in the ground floor rooms open to a large decked area with sunloungers and an amazing vista in all directions. This exceptional house has wooden floors, two bathrooms plus a separate toilet and dedicated off-street parking. This 5 star standard apartment is in the heart of Victorian Ventnor surrounded by an eclectic selection of shops and some of the best places to eat and drink on the Island. High Street Suites 3 has a comfortable double bedroom and an impressive large living room/kitchen/diner with original cornicing, fireplace, crystal chandelier and a bay window over the High Street. Kitchen appliances include a fridge/freezer, double oven, dishwasher and washer dryer. There’s also a modern shower room. This apartment can also be viewed as a well appointed alternative to a luxurious hotel suite and can often be booked by the night. Ventnor is a charming Victorian coastal town built on the sheltered undercliff on the Isle of Wight’s south coast which is dominated by the island’s highest point, St Boniface Down. Known to the Victorians as “England’s Madeira”, the town is noted for its sunny summers (often the most sunshine in the UK) and mild winters. Sir James Clark, Queen Victoria’s doctor, endorsed the health-giving properties of Ventnor’s climate: “nothing along the south coast will bear comparison with it”. In recent years Ventnor has become one of the UK’s best known boutique destinations and is ideal for a relaxing break – it was recently described on BBC Radio Solent as the new Notting Hill and in The Times as “the epicentre of the new Wight”. All five properties are available as holiday cottages for whole weeks and for short breaks outside the main season. Please e-mail us or call if you would like further information or to make a reservation.